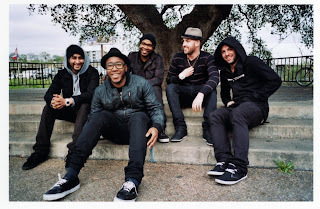 Bad Rabbits - "Doin' It"
Boston's funk/rock/R&B band Bad Rabbits are back with a third single called "Doin' It" from their upcoming American Love record. These guys have been killin' the music scene with their originality and style since 2009 when their EP Stick Up Kids exploded on to the scene. Everything from their catchy melodies, wild energy, and fun grooves, these guys have been on the verge of major stardom for a few years. Now, not only did they recently perform with 311, but now are going on tour with Kendrick Lamar and Steve Aoki for Karmaloop TV. That's pretty damn rad. Stream the third single below and check out the album when it is released May 14th.